Phantom Stranger #1, DC Comics, cover-dated October 1987. "The Heart of a Stranger," by Paul Kupperberg, with art by Mike Mignola & P Craig Russell. Worldwide weather disasters. Tensions in the Middle East. A missing Soviet agent. A cult leader bringing a demon to our world. And appearances by Jimmy Olsen, Commissioner Gordon, and Eclipso! What is the Phantom Stranger going to do, in light of these signs of the times? Listen to the episode and find out! Promo: Midnight ... The Podcasting Hour! ﻿﻿﻿﻿Next Episode: Maybe DC Retroactive Wonder Woman the '70s, DC Comics, cover-dated September 2011. Or maybe Mars #1, First Comics, cover-dated January 1984. Phantom Stranger #21, DC Comics, cover-dated September/October 1972. "The Ressurection of Johnny Glory," by Len Wein, with art by Jim Aparo. "Woman of Stone,"by Len Wein, with art by Tony DeZuniga. What happens when noted Phantom Stranger mega-fan Rob Kelly joins Professor Alan to talk about a real bad dude who sort of survives an execution. And what are Rob's true feelings about Doctor Thirteen? Listen to the episode and find out! Link: Rob Kelly's blog post about this episode. ﻿﻿﻿﻿Next Episode: Phantom Stranger #1, DC Comics, cover-dated October 1987. Have you missed Uncovering the Bronze Age? Well, then this episode is the one for you! Emily gets her sociology on, as she and Alan talk about the 70's phenomenon of Blaxploitation media. 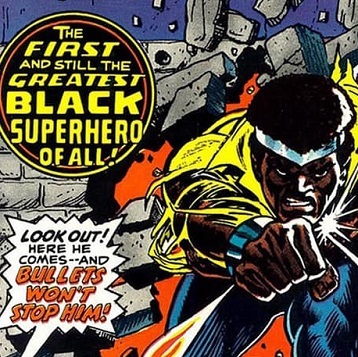 They focus largely on the character of Luke Cage, and what it is about Luke that has made him a popular character to this day. Special thanks to Stella, Donovan Morgan Grant, and Derek Coward for their contributions to this episode.